I am not the one to criticize misleading headlines. After all, I use them all the time, for they can make all the difference between actually clicking on one story or ignoring it forever. 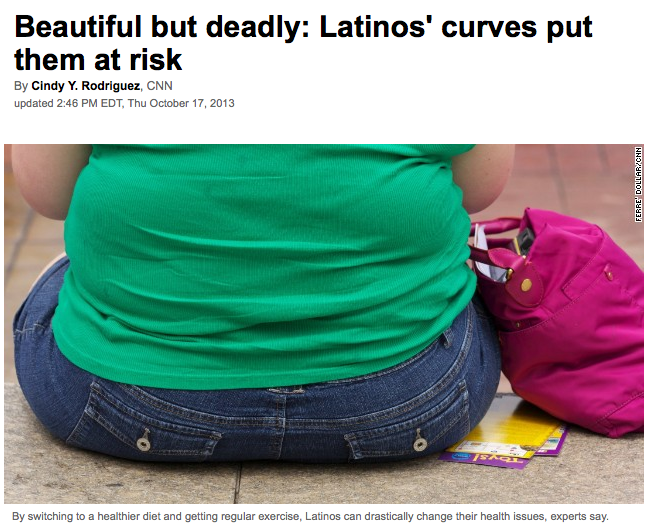 So, when I saw CNN.com had a story about Latinos and our ‘curves,’ I couldn’t help but clicking on it (secretly hoping there would be a mention of big-butted Latinas like myself). To my disappointment, CNN was actually reporting on obesity, diabetes and other health-related issues, and not about my people’s real curves like these ones here or here. This entry was posted in Food, Immigration and tagged CNN, curves, Latinos, obese. Bookmark the permalink. wow what a shame,i hope for them they can get help,god bless.